(Edna) Muriel Upshall was born in 1906 in High River, Alberta. 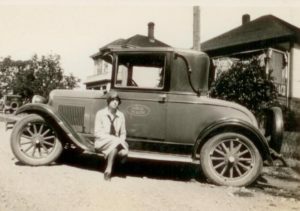 She graduated from the Vancouver General Hospital and University of British Columbia schools of nursing in 1929. For seven and a half years, she worked for the Provincial Board of Health in Nanaimo. From 1936-1937, she worked with tuberculosis patients as one of the first public health nurses in Richmond, B.C. She and Eileen Williams helped found the public health nursing program in Richmond. Upshall then joined the UBC Student Health Services on the campus and worked there until her retirement in 1971. She died in 1989. Fonds consists of 15 centimeters of textual records, 370 photographs, and other graphic material dating from 1920 to 1986 pertaining to the life and career of Muriel Upshall. Diplomas, lists, applications, notebooks, memos reports, letter, cards and other documents relate to her education and career. Correspondence relates to student positions, her provincial Board of Health position in Nanaimo, various projects, professional memberships, student reports and recommended standards and practices for nursing. An item level finding aid is available.